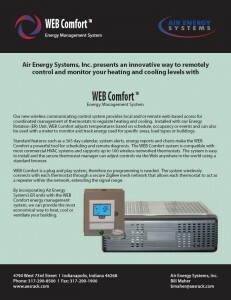 Air Energy Systems, Inc. presents an innovative way to remotely control and monitor your heating and cooling levels with WEB Comfort…an energy management system. Our new wireless communicating control system provides local and/or remote web-based access for coordinated management of thermostats to regulate heating and cooling. Installed with our Energy Rotation (ER) Unit, WEB Comfort adjusts temperatures based on schedule, occupancy or events and can also be used with a meter to monitor and track energy used for specific areas, load types or buildings. Standard features such as a 365 day calendar, system alerts, energy reports and charts make the WEB Comfort a powerful tool for scheduling and remote diagnosis. The WEB Comfort system is compatible with most commercial HVAC systems and supports up to 100 wireless networked thermostats. The system is easy to install and the secure thermostat manager can adjust controls via the Web anywhere in the world using a standard browser. WEB Comfort is a plug and play system, therefore no programming is needed. The system wirelessly connects with each thermostat through a secure ZigBee mesh network that allows each thermostat to act as a repeater within the network, extending the signal range. 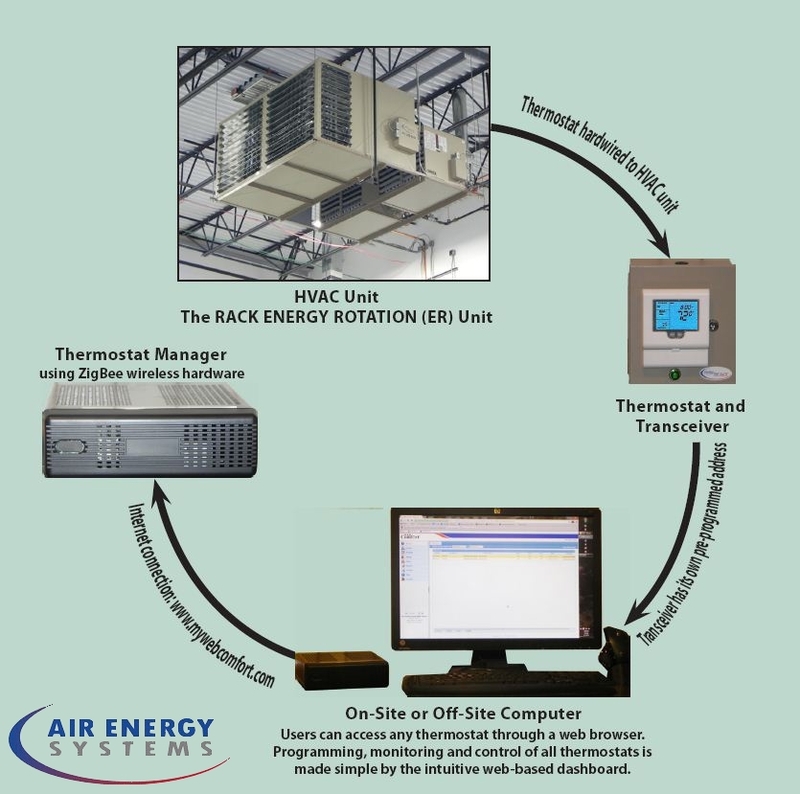 By incorporating Air Energy System’s ER units with the WEB Comfort energy management system, we can provide the most economical way to heat, cool or ventilate your building.